Nithu's Kitchen : Tell us about you Sadhana. Sadhana : I'm an Electronics Engineering graduate, working in the field of Technology in Chennai. My hometown is near Trichy. My life became interesting after marriage. My husband is my entire world. He is very loving, caring and kind hearted person. Nithu's Kitchen : What are your interests Sadhana? Sadhana : I was interested in drawing right from my childhood and have won prizes also. But, after getting into a job, I've no time to draw. I used to write lot of poems and short stories also. Nithu's Kitchen : Why don't you share us one of your poems? புரிந்தது!!! கிடைத்தது வழி மட்டும் அல்ல, வாழ்க்கையும்!!! Nithu's Kitchen : Thank you so much Sadhana. That is such a lovely one. Have you tried any cooking before your wedding? Sadhana : Right from my school days, I had interest towards cooking. But my mom never allowed me to cook. She is the best Mom one could ever have. She would do all the work and I was seldom allowed to help her. Nithu's Kitchen : Do you remember the first dish you prepared after your wedding. Sadhana : Yes, ofcourse. It was tomato chutney. Nithu's Kitchen : We know there is one interesting story behind this "Tomato Chutney". Tell us what happened when you prepared the chutney for the first time. Sadhana : Yeah :-) My mom was worried about my little knowledge towards cooking after my wedding.Though, I had tried few Curries and Briyani before wedding, Mom was not much confident about my cooking skills. Few days after our wedding, I called my Mom and got the recipe for tomato chutney. I managed to prepare it though, not much confident about the outcome. When my husband tasted it, I saw a spark in his eyes with lot of appreciation. I still couldn't forget that look and his words "It's Superb".His lovely words gave me confidence and for dinner, I made mashed potato. That again turned out to be great and My hubby was impressed by my cooking talents. He called my Mom and told her not to worry about her daughter as she had already proved her cooking talents twice. Mom was really excited when she heard my husband praising my dishes. Those encouraging words gave me lot of confidence and later, I got appreciation from my parents also. Sadhana : My husband only gave me the idea for blog. He love all the dishes I prepare and encourages me. Nithu's Kitchen : Do you have any kitchen mishap? Share us the incident and the lesson you learnt from the mishap. Sadhana : A small incident happened (not actually a mishap), the time we bought a microwave oven. I was very excited to use the microwave during the initial stages. At that excitement I forgot to check for the plug point for the oven. I kept the microwave 'ON' with some dish inside and had set the timer more than 5 minutes and left the kitchen. Later when I entered the kitchen after 5 minutes, I saw the plug point fuming with a pungent smell and the wires started melting.... I was like "Oh My God" and switched off the oven then. Later, after checking, we learnt that the oven needed more supply and then we rectified it. Later on, I was very careful while using the electrical equipments. Sadhana : Definitely not tomato chutney :-). 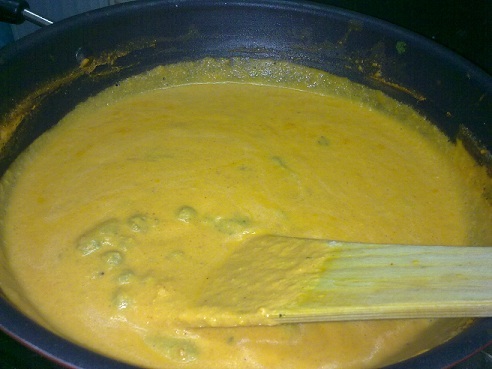 I'd like to share "Peas in Cashewnut Gravy"
Nithu's Kitchen : Why did you select it? Sadhana : I love peas and cashewnut, so I wanted to try this combo. When I made for the first time, the output was good. Boil the tomatoes, peel off the skin and grind to a semisolid form. Grind the cashewnuts and peanuts together to form a paste. Heat oil in a kadai, add cumin seeds followed by green chillies. Saute for few minutes. Add the green peas, turmeric powder, red chilli powder, coriander powder and saute for few more minutes. Add the cashewnut, peanut paste to it followed by ground tomatoes and salt. Add 1 cup of water. Close the lid, allow it to boil for few minutes. Add the garam masala powder and mix the ingredients well. Boil for 10 - 12 minutes. Finally add the coriander leaves and boil for another 3 minutes and switch off the stove. Serve hot with chapathis, poori or rotis. Nithu's Kitchen : Thank you Sadhana. We enjoyed talking to you. Friends, hope you all love Sadhana's delicious Peas in cashewnut gravy. If you are interested to be featured as Nithu's Kitchen's guest, please mail to nithuskitchen[at]gmail[dot]com. A very lovely interview! Was great knowing about Sadhna!. curry looks creamy n delicious! Glad to know more about Sadhana..beautiful dish..
A lovely interview! Glad to know more about Sadhana. The curry looks so creamy and yumm! Nice interview with Sadhana n quite an interesting recipe. Thanks for visiting my blog and leaving ur comment. Very interesting post...glad to know more about you Sadana...you are amazing dear and this recipe is a sure hit...! Good one.. Love the peas curry..